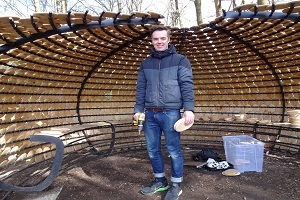 The Inspiring Views project seeks to restore hidden viewpoints, make access improvements and celebrate these views through innovative, sculptural seating. We are currently seeking an artist to create the next ‘Inspiring Views’ artwork. Deadline for submissions is 22 April 2019. Download the full brief here Inspiring Views Artists’ Brief or contact surreyhillsarts@gmail.com for more information. 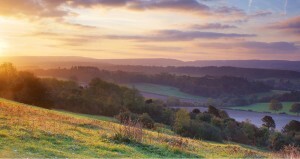 Some of the views are historic and Surrey Hills Arts have worked with partners such as the National Trust and local land owners to restore them, ensure long-term maintenance and improve access for those with limited mobility. 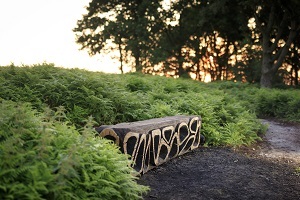 In 2016, The Mittal Foundation sponsored five of these artworks inspired by far reaching views across the Greensand Way. Each individual project includes creative engagement with local communities. All of the artworks respond to their location and incorporate seating providing a reason to visit, pause and appreciate the outstanding view. Each has been beautifully crafted, innovative in design and relevant to the sense of place. Five artists were commissioned to create unique pieces for each site. Click here to find out more about each artist. Poet John Wedgwood Clarke was commissioned as part of the Inspiring Views project to create poetry inspired by the views from the Greensand Way. Click here to find out more & read the poems. Sound artist and musician Graham Dowdall immersed himself in the landscape around the Inspiring Views sites. He spent time walking, talking to people, recording sounds and gazing out at the views. Click here to find out more and listen to his sound pieces. The Inspiring Views artists involved the local community around each of the locations. A series of walks, talks, workshops and demonstrations took place providing an insight into the work of the artist, the geology of the environment and the outstanding landscape. For further information on the Inspiring Views project click here to contact the Programme Manager.